Originally bred to kill rats, the Yorkshire Terrier has a fearless disposition! The Yorkshire Terrier is a tenacious, spunky toy dog breed. They are brave, energetic, and affectionate. They are reknown for acting like a very big dog but in a very small body. Such a dynamic little dog, this is one small dog breed that commands both affection and respect. Yorkies are good with older children and other pets as long as they are familiar with them. They often are wary of strangers and can aggressive with unfamiliar animals. They are often protective of their masters and their family. All of these traits make them good companions within the family, and also great watchdogs. Yorkies are best suited to indoor living, and they do well in small spaces such as apartments. When selecting a Yorkie, watch for signs of partial paralysis and tooth problems. Breed Type The Yorkshire Terrier is a toy breed. Originally bred to kill rats, the Yorkie is now a favorite house dog. They are best suited to warm climates. Background The Yorkshire Terrier is a fairly young breed. Originally from northern England, the Yorkie may have Clydesdale and Skye Terriers, and perhaps Maltese, in its bloodlines. The breed made its way to the United States in the late nineteenth century, quickly becoming a favorite breed. Hybrids include Morkies (Maltese and Yorkie mix) and Yorkie-Poos (Poodle and Yorkie mix). Description Yorkies are black and tan as puppies, turning steel blue and tan at maturity. They have long, fine, straight hair, a medium muzzle, and v-shaped ears. Average weight is 7 pounds, and average height 6-7 inches. Care and Feeding Yorkies should ideally eat mostly dry food, although they can have some canned food mixed in with it. They enjoy and thrive on beef, horse meat, and wheat. Red fish and soy are not recommended for this breed. Yorkshire Terriers need lots of grooming. They should be brushed at least once a week, and preferably once a day. The coat may be clipped to make grooming easier. Teeth require brushing and special attention. The Yorkie's tail is usually docked to medium length shortly after birth. Yorkies may have respiratory difficulties, but frequent cleaning of the dog's living space can help prevent them. The breed sheds very little, so they are not difficult to clean up after. Housing Your Dog Yorkies are best suited to indoor living, and they do well in small spaces such as apartments. They do not require a large yard. Warm climates are best for Yorkies. They enjoy playing with small dog toys. Social Behaviors Yorkies are good with other dogs as well as other types of pets as long as it is familiar with them. It may be aggressive with unfamiliar animals and suspicious of strange people. They get along well with older children. Handling and Training Yorkshire Terriers are very smart, and they generally respond well to training, learning new commands quickly. They can be stubborn, however, and this must be dealt with somewhat firmly. They may be difficult to housebreak. Activities Yorkies do not require as much exercise as some dogs, but they do need daily walks. They enjoy playing, and should be given the opportunity to do so regularly. Breeding/Reproduction Although the Yorkie is prone to some health problems, most are not genetic. Lineage should be considered, however, when looking for mates. Females frequently have trouble delivering their young. Common Health Problems Bronchitis and digestive difficulties are among the most common ailments in Yorkies. These can be treated with medication and changes in diet, respectively. 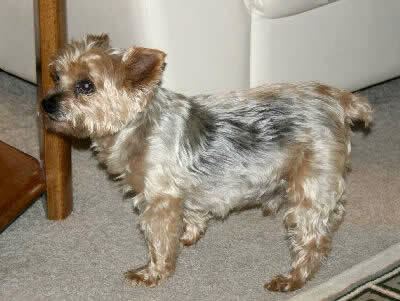 Yorkies may also experience spine problems or fractures due to their fragility. Availability Yorkie breeders are abundant, thanks to the breed's great popularity. Prices vary greatly, averaging between $500 and $1,500, with some dogs selling for over $2,000. My daughter purchased a yorkie about a year ago. He is such a joy and a very precious little dog. He knows that he is a very important part of our family and is treated as such. Cotton is his name and he is, or think he is, a big dog. Talking about protective, he is so protective. We thought we couldn't love a tiny dog but when he came home it was love at first sight. I call him my little grandpuppy (grandson) :). A very good dog and a very special part of our lives. They are awesome dogs, I bet you are having a wonder ful time. My sister-in-law had one, and he had so much character! He did think he was a big dog though, and had no fear of any other dog he encountered on walks. So she had to keep a close eye on him:) Still he was such a joy! I will be happy to provide a home of any puppies if I can. Yorkie breeder from Central Florida.